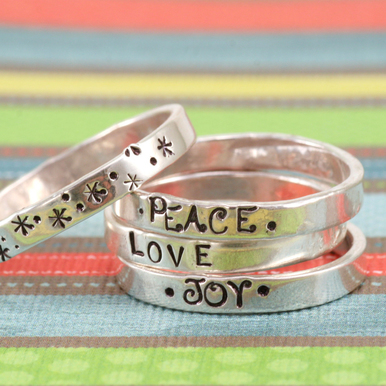 Learn to shape an open back or wrap around ring (no soldering needed!). Do some metal stamping first on the flat ring blank before shaping it. Personalize or texture your rings, the choice is yours. *One tip that is not discussed in the video, you might actually want to add black to your impressions AFTER you shape the ring. Depending on what product you use, if you add the black first and then bend, it can crack the black or stretch it leaving it looking faded.